For fans of MMORPGs, Leonard Nimoy will join Zachary Quinto as voice actors in the multiplayer game, Star Trek Online. Nimoy will be featured in the game's introduction along with key scenes and in-game events. Nimoy was quoted saying, "I am happy to be involved with Star Trek Online. In this game, the essence of Star Trek -- exploration and adventure -- lives long and prospers. I'm pleased that a whole new generation of fans will be able to discover new frontiers in the Star Trek universe." Bringing in the famous voices to the online game is a pretty awesome thing to do. 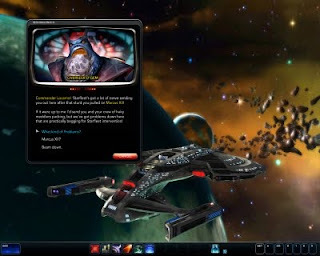 Anyone play Star Trek Online? If so what do you think of it? I could listen to his voice all day if it was in a game. Too bad he's not a main in-game narrator throughout the whole thing.